Kirsten knew she wanted to own her own small business as a senior in high school when she began working part time at Vic’s Corn Popper in Andover, KS. As their first employee, the business owners really invested in Kirsten and taught her the “tools of the trade” so to speak. She was often trusted to run their store while they were out-of-town on weekends. Kirsten graduated from Andover Central HS in 2005 and moved to Lincoln, NE to earn her degree in Business Management. 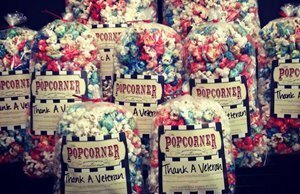 The small business passion carried on with her and she would come back to Kansas to work at the Vic’s Popcorn shop during her school breaks from college as often as possible. She asked the owners of Vic’s at a young age that if they were ever looking to sell the store, to notify her first. Sure enough, 10 years later, they were ready to sell and gave her a call. During those 10 years, her mind was constantly generating ideas on how she could open her very own popcorn company. With the help of her creative family members, The Popcorner was created. We are proud to continue the popcorn tradition under this new brand in the same very location where Kirsten sparked her passion. Kirsten and her family are very excited to announce the opening of their second store on the west side of town which opened in the fall of 2016. 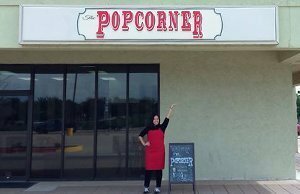 The Popcorner in Andover was recently informed that a corporate retailer would be moving in next door but required almost half of The Popcorner’s space. The space that they needed is critical production and warehousing space for our business. Unfortunately, this does not allow us to continue to operate and grow as planned under these new space constraints in Andover. We want Andover and surrounding communities to understand the predicament that our business has been faced with. We moved our Andover store to Central & Greenwich but it was heartbreaking to leave Andover. The goal is to continue to grow The Popcorner brand and we want to thank you for your patronage over the past few years.